Antique Screwdriver/Hammer Knife Handle 11 inch Rare! 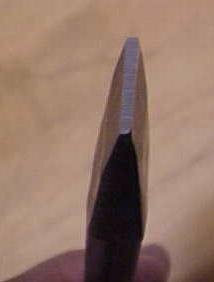 This is a unique, well made, perfect handle, or knife handle slot screwdriver with the mallet or hammer shape at the end of the handle, appears to be design for duel purpose, a 1 pound hammer at one end, and a 1/2" wide slot screwdriver tip at the other end. The overall length is 11.0", and the slot tip width is 1/2" at the end. This is a good heavy duty, well made screwdriver with well attached hardwood handle inserts, held in place by two large diameter metal rivets. The handle has some small chips off near the hammer shaped end, otherwise is in very good condition, with a extra thick steel web in-between the two wood sections, most likely for the extra weight. Nice design! Unique! The tip is in very good shape, ready to use! For large slot screws. We have not seen many with this type of handle shape, even the tip is unique, as it is wider at the end of the shaft, that wide section is over 1" long. A super heavy duty screwdriver with a hammer shape at one end! Items Similar To "Antique Screwdriver/Hammer Knife Handle 11 inch Rare!"